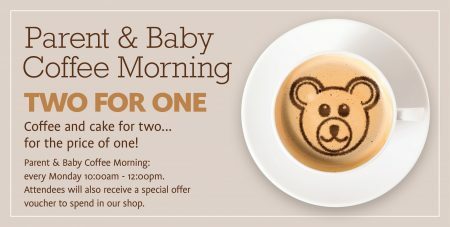 Parent & Baby Coffee Morning – every Monday 10am-12pm – a great chance to enjoy coffee, cake and a chat in an informal setting, bistro and shop offers available at each meeting. Join our Loyalty Card scheme to take advantage of special offers for our members. Sign up next time you visit with a valid email address to take advantage of this scheme.